I had never cooked a lamb chop before, and these delightful New Zealand lamb loin chops were on sale half off at Whole Foods, and oh, it was a great idea. 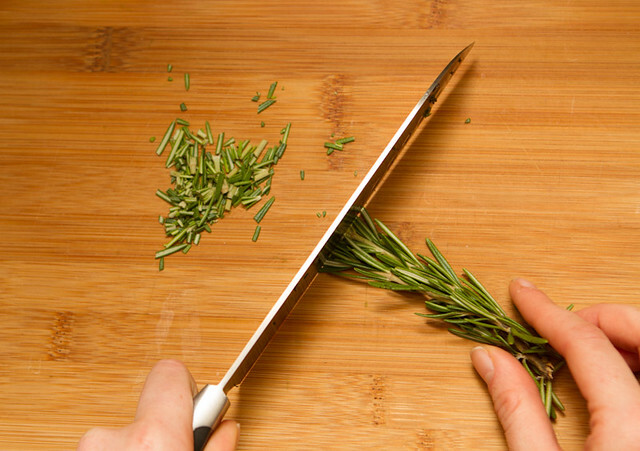 First, grab your rosemary and chop it up as fine as you can. I chopped about two sprigs. 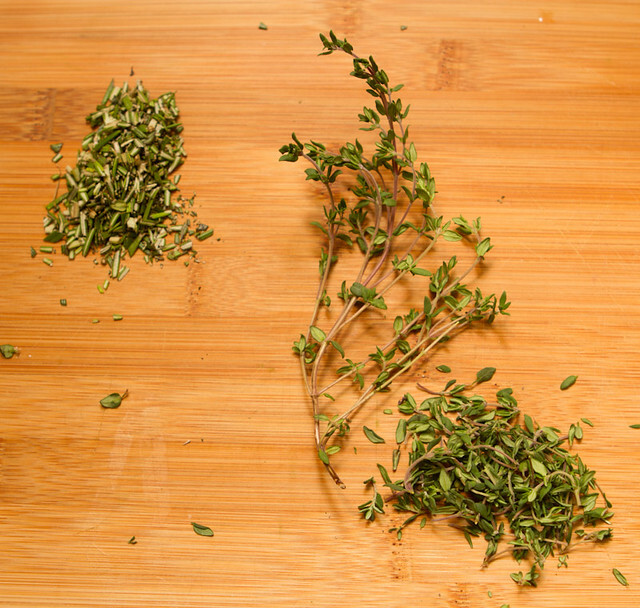 Next, chop your thyme, I did 2.5 sprigs about this size. Next chop 5-6 cloves of garlic, and one big sprig of mint. Chop the garlic finer than I did here, I went back over these a bit. Combine all of these in a small bowl with your salt and pepper. Unwrap your chops. Delicious! Look at that delightful lamb fat. And rub down with your herb mixture. I grated a bit more pepper over top too. I like extra pepper though. Then into the oven they go, they only need about 4 minutes on each side to reach a nice medium-rare. 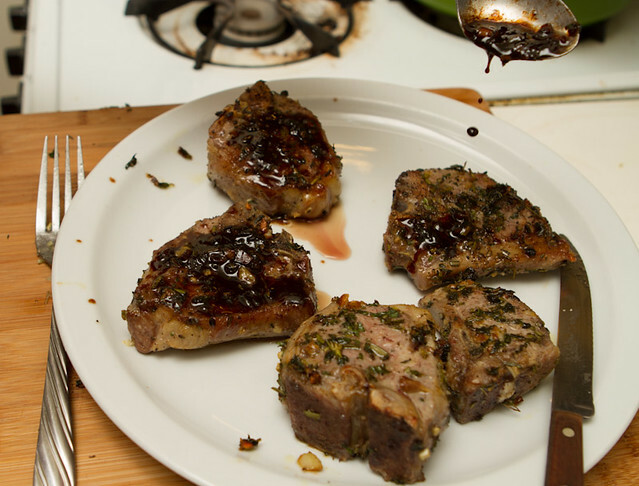 When the lamb chops come out, put them on a plate to settle, and pour your balsamic vinegar and honey into the pan with the lamb drippings and herbs. It'll bubble and boil a lot, so just keep stirring until it starts to thicken. Keep in mind it'll be thicker cool than hot, so stop before it gets too syrupy. Chop the herbs very fine, once you think they’re fine enough, chop some more. 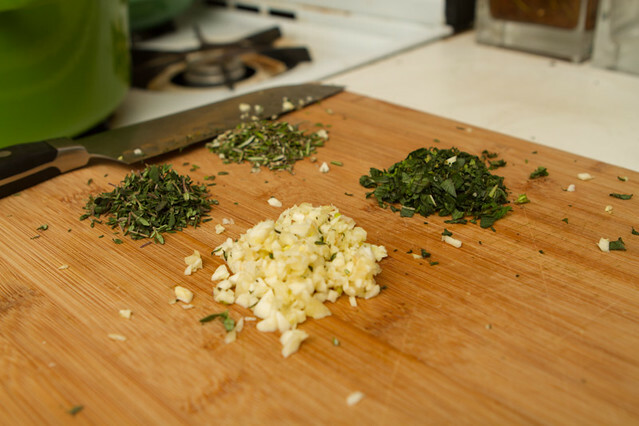 Don’t judge by my photos of minced herbs, I chopped more after taking those. Combine the chopped rosemary, thyme, mint, garlic, salt, and pepper in a small bowl and set aside. 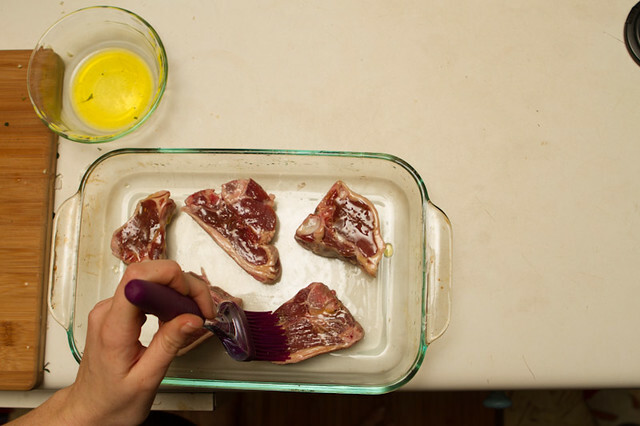 Take out your lamb loin chops and place them on a baking dish or a plate (you won’t be cooking them on this, so don’t worry about what it is), Brush with about 1-2 Tbsp olive oil, until you’ve brushed each side of each lamb chop. Next rub your herb mixture onto all sides of your lamb chops. Set aside any extra herbs. Now, if you have the time, let these sit 30 Minutes - 1 hour. I did not have time, but you should try it as the herb taste will really sink in. 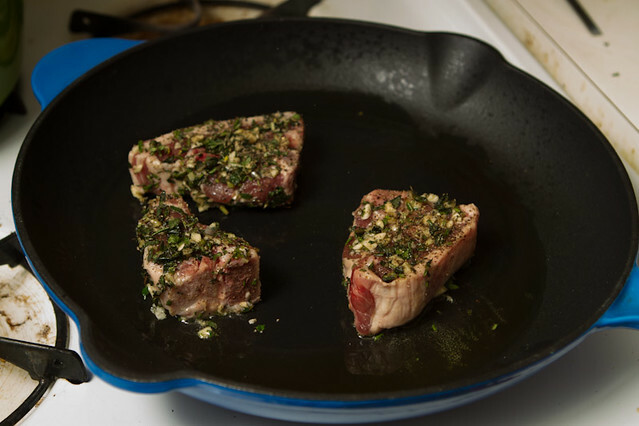 After marinading preheat the oven to 400 degrees Fahrenheit, and pour your remaining 1-2 Tbsp love oil into a oven proof skillet (I love cast iron), heat to medium-high, and add the lamb chops, browning each side (about 2 min per side). 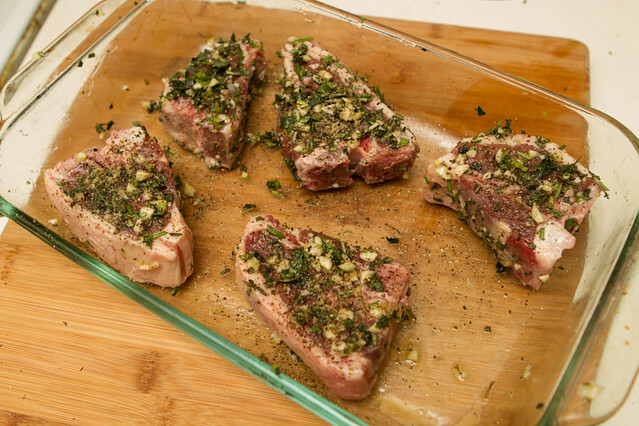 If you have extra herbs from the rub, throw them on the lamb just before putting it in the oven. Place the whole skillet in the oven on the center rack. 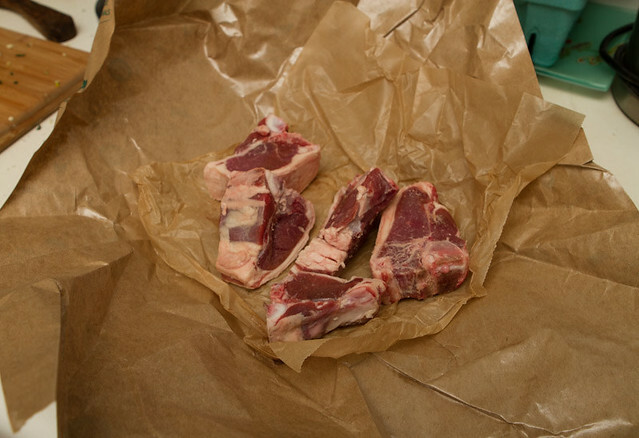 Cook for 4 minutes, flip the lamb chops, and cook another 4-6 minutes depending on your preference for medium-rare or medium chops. I cooked mine a total of nine minutes and they were a perfect medium-rare. For the glaze, remove the chops from the pan and set aside for a moment, leaving all drippings and juices in the skillet. 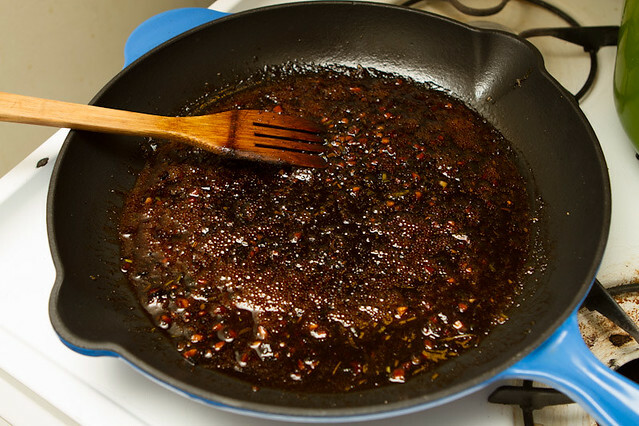 Pour in your vinegar and honey, and return to a medium-medium high heat, which will begin to boil, probably immediately, stir it around a bit the whole time, until it starts to thicken and recue, about 2-3 minutes. Once the lamb chops are served, spoon the reduction over the chop on your plate. Be sure to get some of the delightful burnt herb bits with it. Heavenly. Serve these up with some baked sweet potatoes (a great accompaniment for this as they also bake at 400 degrees, just stab them full of holes and throw them in an hour before everything will be ready), and some wilted collard greens- aka my favorite side dish ever, for a perfect weeknight dinner. Glad you enjoyed the recipe! Thanks for letting me know, I love to hear recipe success stories!